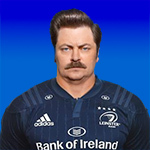 Joe could make it up to Leo and Stu for all the untimely grief he caused us with l'affaire Carbery easily enough so, by playing JGP in a pre-RWC warm-up friendly next summer, if even if just off the bench. Or would it have to be a Test match? I think we have established that he doesn't need an Irish Cap to be excluded from our non-Kolpak list; three years residency here suffices. riocard911 wrote: Joe could make it up to Leo and Stu for all the untimely grief he caused us with l'affaire Carbery easily enough so, by playing JGP in a pre-RWC warm-up friendly next summer, if even if just off the bench. Or would it have to be a Test match? fourthirtythree wrote: Lowe has arthritis and is on medication (most likely an immunosuppressant and biologic) it makes his recovery after matches difficult. It is amazing that a guy with that autoimmune difficulty can be such a beast and such a positive chap! So is it safe to say that he would prefer to play every game (what player wouldn't?) but he probably recognises that his body takes a little longer to recover than most so perhaps managing his game time is actually beneficial to him in the long run????? One of the really impressive parts of our attacking game at the weekend, particularly from set plays was the decoy lines of the midfield and the attack shape. For the second try, Ringrose comes on a line that takes two men out and opens up space. For the third, Henshaw does likewise and Ringrose gets it out the back to Sexton. For the fourth, Henshaw again takes a man out and lets Sexton drift and come around the back. All simple stuff but well executed. Also, Larmour's passing game is really improving. Lovely stop and pass for Lowe's disallowed try. Finally, Lowe's trick of releasing and then picking up the ball is just brilliant. Almost scored a try with it and had another unfortunate knock on that could've let to a big break. It's a lovely smart bit of skill and almost always causes issues. It certainly does if he’s selected and plays for Ireland; then he’s deemed “Irish” and off that non-Kolpak list. So KPH actually needs to play for Ireland and not just be IQ for him to be considered off the non-Kolpak list? This is all incorrect. Being considered a “foreign” player has zero to do with Irish qualification. You have to be resident in a European country for three years under contract to a rugby team to be considered naturalised. It just so happens that three years is the same amount of time it currently takes for JGP to become IQ. For non KOLPAK players who fall under the five year period for Irish qualification, they’ll still be considered naturalised after three years. I don't know. from his description in one interview of lying on the floor in his darkened flat and being good for nothing the day after a game it sounded like it continued here. On the other hand he says he is flying, doesn't have symptoms etc. The drugs these days are, obviously, amazing and of course exercise is now recommended if you can handle it at all. He was delayed getting access to the right medicine in NZ as he had to apply to the regional government for access. They are expensive and a preexisting condition that insurers wouldn't exactly be fond of taking on unless forced. I don't know if Leinster are paying the money or he is on the drug payment scheme here. No idea how it works. wixfjord wrote: One of the really impressive parts of our attacking game at the weekend, particularly from set plays was the decoy lines of the midfield and the attack shape. I haven't seen too many games this season but the attack looks a lot sharper than last season. Contepomi making a difference already. Was similar last week. It is also giving a new life and effectiveness to the cliched Sexton loop. As you say, it's nothing revolutionary but they really seem to be working so well together. A joy to see. I thought he was fine once he got the medicine in his teens? On Second Captains he said that he had to lie beside the fire all day when things were really bad. Are you confusing that with lying in a dark room or did I just not see the interview you're talking about? I watched the game again last night and Josh was even better than I remembered. His defence and workrate during that spell on our line was an absolute masterclass, I was tired just watching him. That should never have happened btw, it was never a penalty to give them territory in the first place and the reason I mention it is because I think it helps to illustrate how dominant we were when their one big spell of attack should never have happened at all. Luke was better than I remembered too. Thought he was good live but his defence really was excellent, he tidied up some messy ball, and made a couple of really good clearouts that he had no real right to make. Deegan impressed me too. He seems like a hard guy for defenders to read, can really turn on the power unexpectedly. I was critical of him falling off tackles in A games before but think he was flawless on Saturday and love how quickly he gets back to his feet, really good performance. This is getting a little intrusive. The guy is entitled to not have the details of any medical condition discussed on here. My only information is his own interviews where he discussed it publicly. Edit: print interviews, didn't hear him on second captains. Harsh compared to Bastereaud's measly five weeks for premeditated assault with the the elbow to the head of an opposing player immobile at the bottom of a ruck!!! Bastareaud seems to have got a ridiculously low basic penalty - six weeks for what seems a pre-meditated hit to the head of a defenceless and prone player. This was added to by one week because of his previously poor record but then remarkably he got a two week reduction to five overall for pleading guilty and expressing remorse (and turning up in a smart suit). So ignoring whether you consider the basic six week penalty in the first place was harsh or not, you get a bigger reduction for saying its a fair cop and you are sorry than you do an increase for your previous record. World Rugby really need to look at this. Would a Welsh/English/Aus/NZ/SA player have received the same penalty as a prominent French player who as captained his country from the Ligue National de Rugby? I have no idea what their form is as a disciplinary body, but if World Rugby are serious about protecting the head, they have to set down minimum penalties, and as importantly, ensure they are enforced. And penalise players more for their previous record than they allow them as a reduction for pleading guilty. The Schoeman 4 weeks is justified. It's basically an elbow smash to the head and whether he ment it or not, it shouldn't be tolerated. Bastereaud's suspension is a joke. I was thinking 5 months. Lar wrote: Bastareaud seems to have got a ridiculously low basic penalty - six weeks for what seems a pre-meditated hit to the head of a defenceless and prone player. This was added to by one week because of his previously poor record but then remarkably he got a two week reduction to five overall for pleading guilty and expressing remorse (and turning up in a smart suit). Forgive me - what did the French Union do?